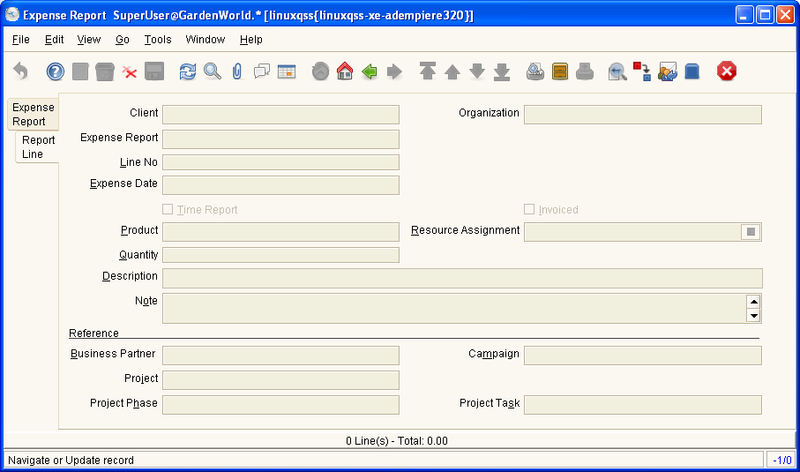 Help : The time and expense report allows you to capture time spent on a project, billable time and to claim expenses. Help : Enter the time and expenses for the Employee or Contractor (Business Partner). The price list determines the default costs of the expenses, products or resource to be reimbursed. In that sense, it is a "Purchase Price" list. The Warehouse is used to correct the inventory of items invoiced to customers (i.e. if not invoiced, the inventory is not adjusted). Please note that the Business Partner must be an Employee with an Address and Contact! Help : Enter the expense items and billable or non-billable hours. If you enter a non-zero amount in Invoiced Amount, that amount will be used for billing the customer - otherwise the price on the current sales price list of the customer. This page was last modified on 14 December 2006, at 13:27.